India is not likely to meet the Millennium Development Goal 4 which aims to reduce mortality of children under five years of age by two-thirds between 1990 and 2015. A major reason for the country’s failure to meet the targets is its inability to keep newborns warm, who need to maintain a body temperature of 370 C.
Babies born with low weight have a tendency to lose heat, or become hypothermic, because they have low energy stores, which cannot be spent on generation of heat, says V K Paul, professor and head of the department of paediatrics at All India Institute of Medical Sciences, Delhi. Such babies need external interventions to make up for the heat deficit. According to UNICEF, such interventions can reduce neonatal mortality or morbidity by 18 per cent to 42 per cent. Traditionally, these are done in various ways, such as keeping the baby dry and clothed, co-bedding with mother, heating the room and kangaroo mother care (KMC) in which a low birth-weight baby is placed on mother’s or father’s chest to offer maximum skin-to-skin contact. When these traditional mechanisms do not work, radiant warmers and incubators are used. But these devices are expensive. In poor countries, low-cost devices that can keep babies warm can be a huge help in checking infant mortality. With this target, non-profits and commercial enterprises are trying to develop low-cost warmers. Embrace Nest, one such attempt by a team from the US and India, is a simple device that could provide a constant temperature and does not require continuous power supply. An interesting aspect of the product is that the researchers at Embrace Innovations were in constant touch with the end users during the development phase of the product. The team, in a 2014 paper published in the Journal of Public Health, says they identified two main categories of end users: physicians and nurses at hospitals or clinics where births take place (health centre end users); and mothers, midwives and community health workers in urban and rural settings (community end users). They conducted a series of focus groups and interviews to identify the end users’ perceptions of current devices. The team had initially planned to make a single product. Later, it decided to make two different products with the same basic technology for the different groups. The final products have two parts—a pouch made of phase-change material that is attached to an electric heater and a cocoon-shaped sleeping bag with a hood in which the pouch is placed. The pouch has an indicator to show when the heating is done, which takes approximately 30 minutes. The bag is designed such that the heat from the pouch is evenly distributed throughout the bag for up to six hours and the pouch does not touch the baby at all (see ‘How the warmer works’). “For health centres, we designed a precision electric heater to ensure that the pouch heated to the correct temperature while minimising risk of overheating… We maintained the portability of the heater to allow within-facility transport. For the community, we modified the sleeping bag to lie flat to allow the baby to sleep safely, and eliminated portability from the design,” the research team wrote in the paper. The warmer for health centres is called Embrace Nest and the other is called Embrace Care. The efficacy of the product was checked in a study by Somashekhar Nimbalkar, head, Neonatal Intensive Care Unit, Shree Krishna Hospital and Pramukhswami Medical College in Anand, Gujarat, and colleagues. The team talked to 52 paediatricians in different cities of Gujarat to check the usability of the device. All the paediatricians found the device useful. More than half of them (58.8 per cent) did not report any disadvantage or problems; over 14 per cent found it too expensive at Rs 15,000; more than 33 per cent had problems with temperature regulation and 33.3 per cent were unsatisfied with cleaning, disinfecting and charging. The paediatricians, who normally recommended KMC to their patients, said that the ease of operation makes embrace warmers useful. According to Nimbalkar, “We have been recommending KMC for many years but when we reviewed our practices, we found that they are not ideal. Hypothermia still exists and Embrace is solving the problem. Ideally, KMC should have been the solution, but going the Embrace way is much easier.” The findings were published on October 30, 2014, in Advances in Preventive Medicines. So far, Embrace warmers have helped nearly 76,000 infants in India. Another similar product is Incublanket, which is being made by US company Warmilu. The team is now running an “effectiveness clinical trial on a larger patient population in the US” and has started taking pre-orders. Gurgaon-based company Pluss Polymers is also developing a low-cost, electricity-independent product which can keep a baby warm for up to 24 hours. “Such products can change the face of neonatal care in the developing world,” says Sanjay Wazir, chief of neonatal medicine at Apollo Hospital, Gurgaon. He says Embrace warmers at his hospital have been used for “ambulance transfers” and that he hopes to see more such products in the market. Neelam Kler, chairperson, department of neonatology, Centre for Child Health, Sir Ganga Ram Hospital, New Delhi, believes warmers and traditional methods such as KMC have separate uses. 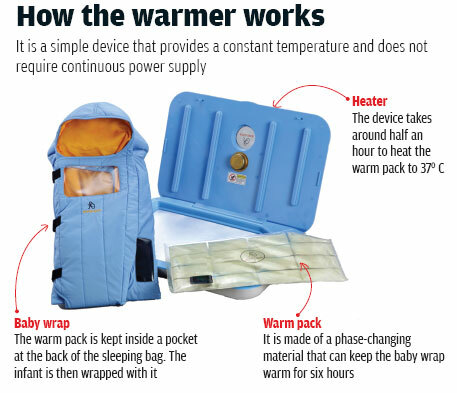 “KMC may be more suitable for a high-risk baby, whereas such warmers may be helpful in transporting babies,” she says. “One-third of our admissions are born outside our hospital and two-thirds of these babies are transported without proper precautions. About 70-80 per cent of these babies are hypothermic at admission,” she adds. There have been a few attempts to address Hypothermia in children. The cost of Embrace warmer (around Rs. 15,000/=) is quite too high. Moreover, the details of substance which provide heating is not disclosed which restricts their widespread fabrication and use. We have designed a sleeping bag for newborns with a unique warmer. The warmer pouch works on principle of phase transition. These pouches are filled with 1 kilogram of crude palm oil. Crude palm oil is used in most mills and soap manufacturing units as a raw material and it costs around Rs.70 per Kg. The present sleeping bags along with two oil pouches presently cost around one thousand rupees.